Ears on your sunglasses and Grumpy Cat on your bikini. That's what summer looks like as a cat gal. If you have to suffer through the unbearable heat, then why not up your game with these five summer staples that have received the feline treatment. Cat swimwear and shorts won’t shield you from the sun, but at least you’ll sweat it out in style. My favorite things in the world are cats and cupcakes (because I’m five years old and don’t even care anymore), which is why it’s impossible for me to find fault with this candy-colored two-piece by Mr. Gugu and Miss Go. The Polish designers are known for their all-over printed fashions, which are covered in the likes of hamsters and hamburgers, but their cat designs are what originally got me meowing about them. I last featured their crazy-eyed kitty bikini in a post featuring even more ridiculous(ly awesome) cat swimwear, which you should definitely check out before hitting the pool. Cat-eye sunglasses are essential for any glamourpuss worth her kitty glitter (you know I have a pair), but why not turn it up a notch with a pair of designer shades that feature a fierce pair of perfectly formed ears? These ultra luxurious sunnies by Ren├® Chu for Rev├® are a splurge at $320, but because I love you, I found a similar pair you can snag for just $10 bucks over at Shop Jeen (I’m also loving them in tortoise!). Okay, so technically these groundbreaking flip-flops are made for children, but even if you haven’t been blessed with a little rugrat (or the gift of tiny feet), you can still appreciate these creative albeit uncomfortable-looking sandals by Kiko+. 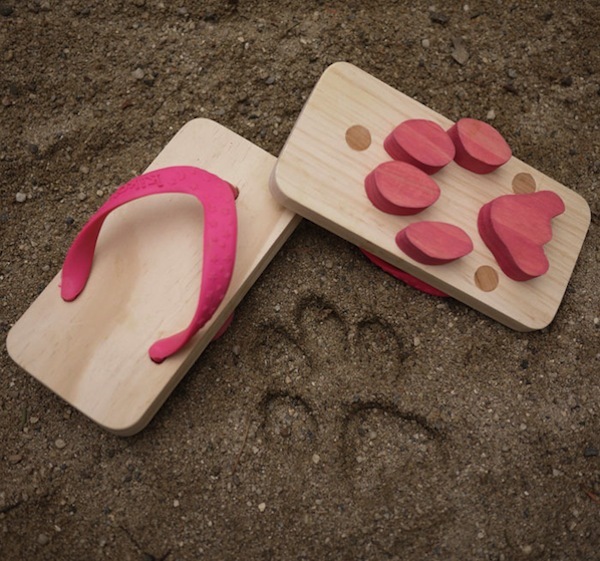 The Ashiato thongs (“ashiato” means footprint in Japanese, or so I’ve been told), which leave an unbearably precious trail of kitten paws behind in the sand, were based on the designer’s interpretation of a form of traditional Japanese footwear that is a cross between clogs and flip-flops. While my sensitive hooves cringe at the thought of walking on wood, I would still sport them in the name of scientific research, if only they came in my size. Shorty short shorts are all the rage this season, and if you’re brave enough to rock some denim underwear, then you’re definitely cool enough to wear a pair of cut offs with cats all over them. I found a wealth of one-of-a-kind, vintage, and custom made kitty shorts over on Etsy (where else? ), but my favorite designs were from Bad Land Apparel. My picks? These bleached, high-waisted Tommy Hilfiger shorts, and another badass pair accentuated with silver studs and lucky maneki neko cats. All right, so it’s time to pack up the cats and head to the beach. Sunscreen and snacks? Check. A good book and/or some trashy magazines. Yes. 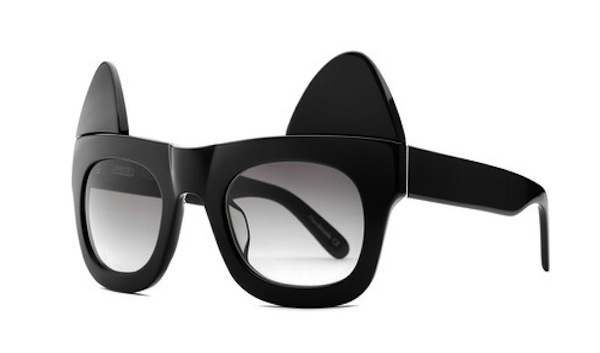 Super cool feline inspired sunglasses and wooden cat paw flip-flops? Check, check, check. Now where to put it all? 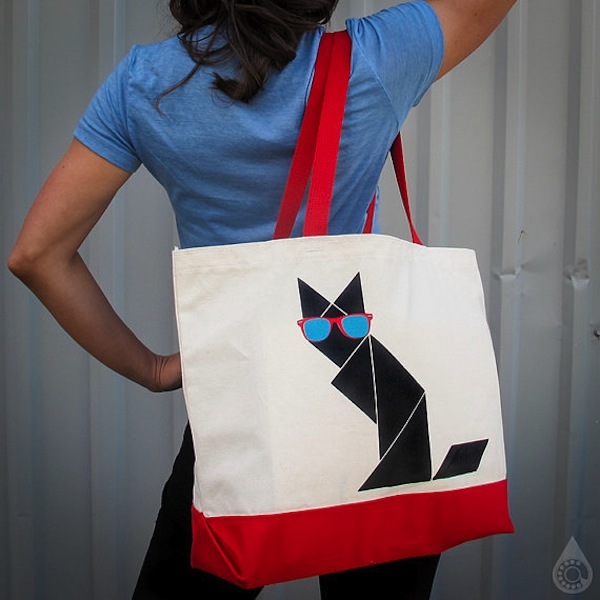 I’m a longtime fan of Hotline Design Ink and their cool kitty Tangram tote. The bottom is gusseted so there’s plenty of room to stash all your crap, plus I can never say no to a cat wearing sunglasses. It’s a perfectly beachy and carefree look for the cat lady who has it all and isn’t afraid to show it.